Apple has released an update to its Thunderbolt software after reports arose that the previous version was causing boot-related problems for some Mac users. The Cupertino, Calif., company on Monday pushed out version 1.2.1 of its Thunderbolt software, adding support for its Thunderbolt to Gigabit Ethernet adapter. The download weighs 526kb and requires OS X 10.7.4 or later. An earlier version of Apple's Thunderbolt software arrived last week, but it is believed to have caused freezing and boot error problems on a number of Macs. The problems were reportedly caused by a kernel extension that was making the connectivity kernel incompatible with the machines. 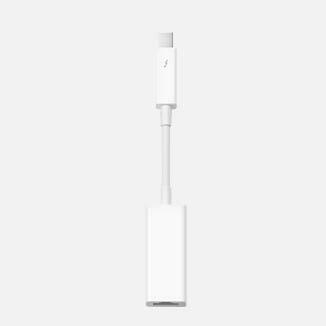 The new Thunderbolt to Gigabit Ethernet adapter is designed to pair with Apple's new MacBook Pro with Retina Display. In order to make the new notebook thinner and lighter, Apple cut several ports and components, such as an optical disc drive and the Ethernet port, from it. Though Apple has sold its MacBook Air computers without Ethernet ports for years, it sold USB adapters for them.